Presently the Jews rule over all of Jerusalem, even though East Jerusalem is mostly comprised of Arabs. The Palestinians want this half for their capital. But most of the Jews won’t budge, saying they must rule all of Jerusalem. Both sides proclaim that they must rule East Jerusalem or there will be war! Here is the real shocker. Did you know the Bible prophesies about this one half of Jerusalem and the super-miraculous outcome? It is a prophecy that will stagger your mind. “Behold, the day of the Lord cometh, and thy spoil shall be divided in the midst of thee” (Zechariah 14:1). The subject is the Day of the Lord—the end time. This whole book is focused on the latter days. “For I will gather all nations against Jerusalem to battle; and the city shall be taken, and the houses rifled, and the women ravished; and half of the city shall go forth into captivity, and the residue of the people shall not be cut off from the city” (verse 2). Christ prophesied that He would “gather all nations” to battle Him in Jerusalem. Then He makes what might appear to be a strange statement. One half of Jerusalem is to be taken captive. Notice how specific this prophecy is. East Jerusalem—one half of the city—will be conquered by the Palestinians! The nation of Israel was established in 1948. At that time the Jews only had roughly one half of Jerusalem. The Arabs had East Jerusalem. Zechariah 14 is also a prophecy that the Jews would conquer all Jerusalem, because in order for half the city to be taken just before Christ returns, the whole city must be controlled by the Jews just before that time! The Jews did take full control in the 1967 war. So the prophecy in Zechariah 14:1-2, which has not yet been fulfilled, has to happen between 1967 and the Great Tribulation. Jerusalem is going to be totally captured in the Tribulation (Revelation 11:1-3). Many prophecies tell us that. Today the Arabs live in roughly one half of Jerusalem. They just don’t control it—yet. When such an attack occurs, the Jews couldn’t effectively drop bombs, especially nuclear bombs, on one half of their own city. Looking at the ongoing violence in Jerusalem today—the absolute inability of the involved parties to solve things by peaceful means—we can easily see how one half of Jerusalem shall be taken captive in the very near future. The present violence is an embryo that is about to grow into much greater violence. That is the critical event prophesied in Zechariah 14:2. We will see this prophecy in Zechariah 14:1-2 fulfilled very soon. And while it will involve some sickening atrocities and bloodshed, it is directly connected to the greatest news this world has ever heard! The first half of that verse is talking about a great climactic battle that will occur at Christ’s return. Again, at the time of this final battle, the whole of Jerusalem will have been captured—by German-led European armies, called the king of the north (Daniel 11:40-41). We will look at these events in detail later. The question is, why does the last half of Zechariah 14:2 talk about only half the city being taken? Consider it: The Day of the Lord and the dispute over one half of Jerusalem are presented in the same context. That is because when half of Jerusalem goes into captivity, that crisis triggers a series of events that leads to the return of Jesus Christ! One half of Jerusalem being taken captive is like the first domino to fall leading to Christ’s return and battle against all nations in Jerusalem! It all begins and ends in Jerusalem. In other words, the current dispute over East Jerusalem is a strong sign that the Day of the Lord is almost here! We must wake up! Men must heed God’s warning before it is too late! Any peace talks over Jerusalem make headlines around the world. But here is the greatest “scoop” of all, and the news media totally ignore it! The peace talks will lead directly to the fall of East Jerusalem. This battle will trigger events that lead to a nuclear World War iii! This will be the crowning result of man’s best efforts to bring the world peace! Thankfully Jesus Christ will intervene just before all life has been exterminated (Matthew 24:21-22). Then Christ will usher in 1,000 years of peace. “Then shall the Lord go forth, and fight against those nations, as when he fought in the day of battle. And his feet shall stand in that day upon the mount of Olives, which is before Jerusalem on the east, and the mount of Olives shall cleave in the midst thereof toward the east and toward the west, and there shall be a very great valley; and half of the mountain shall remove toward the north, and half of it toward the south” (Zechariah 14:3-4). The Jews and Palestinians will never settle the Jerusalem issue until Christ returns. Christ is obviously not a part of the peace talks. He is nevertheless orchestrating the overall direction of these events. Shortly after the fall of East Jerusalem, and much more violence and warfare, Christ will return. He will stand on the Mount of Olives. That famous mountain will divide, creating a huge valley. Only Jesus Christ can and will settle the Jerusalem issue! Why won’t more people recognize the truth of this prophecy? Why won’t they listen, when it is about the violent outcome of a world-famous peace process where men are fighting verbally for the rights to East Jerusalem? And it is tied directly to the return of Jesus Christ—the greatest event ever to occur on Earth or in the universe! This prophecy is thrilling, wonderful and awesome! It ought to stir the imagination of the whole world! But men are too drunk on deception to comprehend what is happening. Only great violence can sober them. When will men learn that they don’t know how to bring true peace? Now let’s examine in more detail the chain of crises to follow the capture of one half of Jerusalem. We have shown that the peace process is Judah’s wound. But the Jews do not see it that way—yet! However, when one half of Jerusalem is taken captive, they will see that it all happened as a part of the Middle East peace process. Their wound, or the peace process, primarily causes them to lose one half of Jerusalem. At the mercy of the Arabs, little Israel will feel backed into a corner. As we covered in the last chapter, the Jews are prophesied to go to Germany for help. “When Ephraim [Britain] saw his sickness, and Judah [Israel] saw his wound, then went Ephraim to the Assyrian [Germany], and sent to king Jareb: yet could he not heal you, nor cure you of your wound” (Hosea 5:13). The Hebrew clearly indicates that both Israel and Britain go to Germany for help. Both Judah and Britain are in danger of falling. By this point, America will be too weak and too sick itself to help. We are already seeing Israel beginning to look to Germany for help. However, Hosea 5:13 will probably be fulfilled after the Arabs take over East Jerusalem. God tells Judah that Germany cannot “heal you, nor cure you of your wound.” Why does God say that? Because Judah got into this mess by looking to men. Now it is trying to get out of the quagmire by looking to men. The people of Jerusalem will never find a cure or be healed until they look to God! That is what God is teaching them—the hard way. At that point in the course of future events, another prophecy fills in some vital details. The king of the north is going to come against him like a “whirlwind.” Gesenius defines whirlwind this way: “a storm or tempest … to sweep away in a storm” or “to be fierce as a tempest.” Strong’s Concordance states, “by implication to cause to shiver with fear.” It leaves people terror-stricken. After the German-led European armies conquer the mighty king of the south, the world will tremble and the Germans will feel invincible! The king of the north immediately enters the glorious land, specifically Jerusalem. That is a strong indication that the war was triggered over that city. Anyhow, Jerusalem is its main concern. The Vatican has said that Jerusalem must be an international city. The Catholic Church, like the Arabs, also has a passionate interest in this city. The Vatican and Germany are the heart of the Holy Roman Empire. They have conquered Jerusalem several times before. And they are destined to do so one last time! Even though Germany cannot help the Jews, the Germans do get involved in Jerusalem. The Catholic Church is going to unite with and then guide the European Union, or the king of the north—with Germany as the real power behind it. Three great religions—Christianity, Judaism and Islam—all have an intense interest in Jerusalem. That city is the third-most holy site to the Muslims. It is the most holy city for the Jews. Christians consider it their first or second holiest city. In the end, it is going to bring disaster to all three religions. “And in that day will I make Jerusalem a burdensome stone for all people: all that burden themselves with it shall be cut in pieces, though all the people of the earth be gathered together against it” (Zechariah 12:3). Even the United Nations is burdened down with Jerusalem. Those nations that burden themselves with that city will be “cut in pieces.” Instead of trusting God for a solution, they trust men. Because of its past and future, Christ has more interest in that city than in any other city on Earth. Christ died in Jerusalem. He and His Father are going to rule the Earth and the universe from there! This takes us to another critical end-time prophecy. Jerusalem is to enter one last bloodbath before Christ returns. “When ye therefore shall see the abomination of desolation, spoken of by Daniel the prophet, stand in the holy place, (whoso readeth, let him understand:) Then let them which be in Judaea flee into the mountains” (Matthew 24:15-16). Some translations read the abomination that makes desolate. What is this abomination of desolation? Let’s look at Luke’s account: “And when ye shall see Jerusalem compassed with armies, then know that the desolation thereof is nigh” (Luke 21:20). Here the abomination is just called armies. This army is the king of the north—not an Arab army. Why is this European army surrounding Jerusalem? At this point, the main power of the Arab world will already be destroyed. This army has just conquered the king of the south and is probably there to keep peace in Jerusalem. The Holy Roman Empire will undoubtedly make some kind of a peace pact to protect Jerusalem. It will look like the world is about to have peace. The beast power will enter into Jerusalem. At that point, this European power will double-cross the Jews (see Ezekiel 23). It will become one of the greatest double-crosses in the history of man. At this point, people will realize that Judah’s “wound” leads to a cataclysmic end! Suddenly, in a moment, the Great Tribulation begins—the worst time of suffering ever on Earth. God’s very elect will escape all this violence. “Then let them which are in Judaea flee to the mountains; and let them which are in the midst of it depart out; and let not them that are in the countries enter thereinto” (Luke 21:21). When the European Union armies surround Jerusalem, God’s people only have days to escape! They understand Bible prophecy and what is really going to occur. They see this as a sign to flee. So they flee to a place of safety (Revelation 12:14). They remain there during the Tribulation and the Day of the Lord. “He shall stretch forth his hand also upon the countries: and the land of Egypt shall not escape. But he shall have power over the treasures of gold and of silver, and over all the precious things of Egypt: and the Libyans and the Ethiopians shall be at his steps [or at his feet]” (Daniel 11:42-43). This is all part of the destructive rampage of the king of the north. The unprecedented scale of bloodshed and conquest by the king of the north greatly disturbs the Asiatic millions in Russia and China. They will not sit idle. “But tidings out of the east and out of the north shall trouble him: therefore he shall go forth with great fury to destroy, and utterly to make away many” (verse 44). Russia and China will ally themselves against the king of the north. This will be very troubling to the beast power. “And he shall plant the tabernacles of his palace between the seas in the glorious holy mountain; yet he shall come to his end, and none shall help him” (verse 45). The great religious beast of Revelation 13 will move its headquarters to Jerusalem out of fear. This will probably include the political beast as well. Both of these powers know how violent Russia and its allies can be. They need to remember only as far back as World War ii. That is why “tidings out of the east and out of the north shall trouble” them. 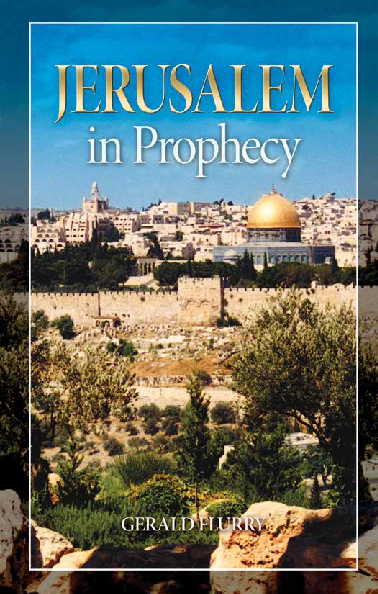 Here is an end-time prophecy that includes Israel and Judah. “Thus saith the Lord of hosts; The children of Israel and the children of Judah were oppressed together: and all that took them captives held them fast; they refused to let them go” (Jeremiah 50:33). Israel and Judah were not oppressed together in their ancient captivity. This is a prophecy for the end time. Israel went into captivity in 718-721 b.c., while Judah’s was over 100 years later, in 585 b.c. “A sword is upon the Chaldeans, saith the Lord, and upon the inhabitants of Babylon, and upon her princes, and upon her wise men” (verse 35). Then the king of the north will be destroyed. His headquarters at that time will probably be in Jerusalem. “As God overthrew Sodom and Gomorrah and the neighbour cities thereof, saith the Lord; so shall no man abide there, neither shall any son of man dwell therein. Behold, a people shall come from the north, and a great nation, and many kings shall be raised up from the coasts of the earth. They shall hold the bow and the lance: they are cruel, and will not shew mercy: their voice shall roar like the sea, and they shall ride upon horses, every one put in array, like a man to the battle, against thee, O daughter of Babylon. The king of Babylon hath heard the report of them, and his hands waxed feeble: anguish took hold of him, and pangs as of a woman in travail” (verses 40-43). The European Union then will begin to tremble. This is the same fear mentioned in Daniel 11:44. Sodom and Gomorrah were destroyed totally by fire from heaven. Soon Europe is going to suffer destruction and be left like Sodom and Gomorrah! It too will receive fire from heaven. The religious beast will try to solve its problems by moving to Jerusalem. But that move will fail. Only God can bring the world peace. That is just what He says He will do. And that peace will begin in Jerusalem. Before that, however, the crescendo of global tension will hurtle toward its explosive conclusion. The united armies of the massively populated Asian bloc will make their entrance. Great destruction is about to lead to greater destruction. Nothing will stop the massive Asiatic army of 200 million people! (Revelation 9:16). Only Russia and China could amass such a gigantic army. They will be the only other world power, besides the European Union. God has reserved them to destroy most of the European power. God is going to dry up the Tigris and the Euphrates rivers. Massive armies shall flow into the Middle East and Europe—heading toward Jerusalem. That makes it very difficult for the European army to use nuclear power. It doesn’t make much sense to bomb yourselves. “And he gathered them together into a place called in the Hebrew tongue Armageddon” (Revelation 16:16). God gathers them into the plain of Megiddo. Armageddon means armed Megiddo. There will be only two real military powers left at that time—the king of the north and the Russia-China axis. They will meet and be ready to clash in the plain of Megiddo—located in northern Israel, where there is a huge air base and a gigantic area to assemble armies. Great military strategists will think they are making all these plans. But in truth, the supreme military strategist behind all this is God! This event in Megiddo leads to another chain reaction. They see Jesus Christ returning to this Earth and both armies decide to fight Him, instead of each other. “For, behold, in those days, and in that time, when I shall bring again the captivity of Judah and Jerusalem” (Joel 3:1). Judah and Jerusalem (a type of all Israel) are in captivity. “I will also gather all nations, and will bring them down into the valley of Jehoshaphat, and will plead with them there for my people and for my heritage Israel, whom they have scattered among the nations, and parted my land” (verse 2). God says, “I will gather all nations.” This is the same language used in Zechariah 14:1-2: “Behold, the day of the Lord cometh, and thy spoil shall be divided in the midst of thee. For I will gather all nations against Jerusalem to battle ….” Jesus Christ gathers the main armies of the Asiatic millions and those of the Holy Roman Empire to Jerusalem. It is there that Christ puts an end to warfare and brings peace to the Earth (verses 3-4). It all started with one half of Jerusalem being captured! Though the armies will gather in the plain of Megiddo, the battle involving “all nations” will take place in the valley of Jehoshaphat. This deep valley, or ravine, borders Jerusalem on the east, between the city and the Mount of Olives. Today it is more commonly known as the Kidron Valley. Jehoshaphat means “judgment of the Eternal.” The rebellious and unrepentant nations of this world will be judged there by God for their disobedience! The world’s armies will converge on Jerusalem to fight Jesus Christ. The confrontation is called in the Bible “the battle of that great day of God Almighty” (Revelation 16:14). It is not the “battle of Armageddon” as some mistakenly assume. That is because it will not take place at Armageddon! It all revolves around Jerusalem. Zechariah 14:12-13 graphically describe this supernatural confrontation at Jerusalem with the world’s armies. They will turn against each other in mistrust and fear as their very flesh decomposes and their eyes cease to see! The blood is going to be up to the horses’ bridles! “And the angel thrust in his sickle into the earth, and gathered the vine of the earth, and cast it into the great winepress of the wrath of God. And the winepress was trodden without the city, and blood came out of the winepress, even unto the horse bridles, by the space of a thousand and six hundred furlongs” (Revelation 14:19-20). The length of 1,600 furlongs is about 200 miles. The Valley of Jehoshaphat is going to become a river of blood, roughly 4 feet deep and about 200 miles long! That is almost too much blood to even imagine. However, the Asiatic armies alone have 200 million soldiers. This is how God will “plead with them”—in the only language they understand! Just the mention of these prophecies ought to frighten men into repentance. But men have no idea of how hard and rebellious they are! “And he shall pass over to his strong hold for fear, and his princes shall be afraid of the ensign, saith the Lord, whose fire is in Zion, and his furnace in Jerusalem” (Isaiah 31:9). Christ’s fiery furnace will be in Jerusalem! This is where God will refine His created Family. After the dust settles from this incredible conflagration, Christ will establish His government in Jerusalem. Global peace will finally break out! What looks so gloomy and dark in Jerusalem today is almost ready to start this chain reaction. It will lead to the greatest event ever to occur in history, not just the history of this Earth, but the history of the universe—the return of Jesus Christ! Thank God that glorious event is about to explode on this planet! What a momentous time to be alive!